Hello and welcome (or hopefully, welcome back) to yet another of my field blogs! It’s a chilly day here in Greenbelt, Maryland, and I am packing away my warmest parka and sleeping bags – yes, I said bags, in plural, since I will need two to keep me warm enough during my upcoming field work. This time, my team and I are off to southeast Greenland to investigate not ice, but water we believe is trapped within the ice. During this expedition, jointly funded by both the National Science Foundation and NASA, we will be camping on the ice for a little over a week in a very remote area of the Greenland ice sheet. We will gather as much information as we can about the captive water, which we termed a perennial firn aquifer. This will be a very exciting field campaign because it is exploratory: we don’t know much at all about the aquifer, so we will attempt to determine some of its basic properties and which tools work best for exploring it. The (tiny) red star marks the approximate location of our drill site in Greenland. Let’s start with what we do know. In 2011, during the Arctic Circle Traverse (ACT), two of our team members, Rick Forster and Clement Miege, were involved with a drilling project to investigate how much snow falls in southeast Greenland. That region has the largest amount of snowfall in all of Greenland (for Twilight fans, think of this place as the Forks of Greenland: cold, dark and wet. And let’s add windy to the list as well.) Because southeast Greenland has such high snowfall and is relatively far way from any established camps, it’s a difficult place to work. Hence, not many ice cores have been drilled in this region. That’s why the ACT traverse went to Southeast Greenland: to collect much-needed cores . When they were drilling their last one, closest to the edge of the ice sheet and about 65 feet (20 meters) deep, and they pulled up the drill, they found water dripping out the end of the core barrel. This was quite a shock. The ACT team looked at their radar data, which can show the top of a water layer but not the depth, and were able to trace the water mass. They drilled again a few miles away and again hit water. The drill they were using was not designed to drill into water, so they had to stop. But they had discovered something new. And why does it matter there’s an aquifer buried under the ice, you might wonder? It is important because water that is released from the Greenland ice sheer can directly raise sea level. We are not sure that this water will ever be released, or if the quantity of water is large enough to matter, but anytime ice melts to water and has the possibility to leave the ice sheet, we want to know more about it. Now Rick and Clem have invited myself and two others to go back and find out more about this water. So here is the formal team lineup. The team is lead by Rick Forster, a professor of Geography at the University of Utah who specializes in remote sensing of the cyrosphere. Clement Miege (Clem) is a PhD student from the University of Utah who studies accumulation using radars. Ludovic Brucker (Ludo) is a research associate for University Space Research Association at NASA Goddard Space Flight and is an expert in remote sensing of the ice sheets as well as sea ice. (You may remember Clem and Ludo from the SEAT traverse blog in Antarctica.) Jay Kyne is a driller from the University of Wisconsin’s Ice Drilling Design and Operations (IDDO) program. And then there’s me, Lora Koenig, a remote-sensing glaciologist from NASA Goddard Space Flight Center. 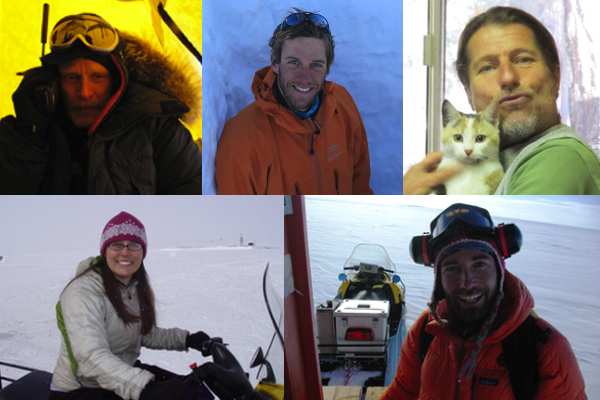 From top left, clockwise: Rick Forster, Ludo Brucker, Jay Kyne (his furry friend won’t come to Greenland), Clement Miege and Lora Koenig. We have assembled a great rough and ready team with a broad assortment of tools to learn as much as we can about the aquifer. 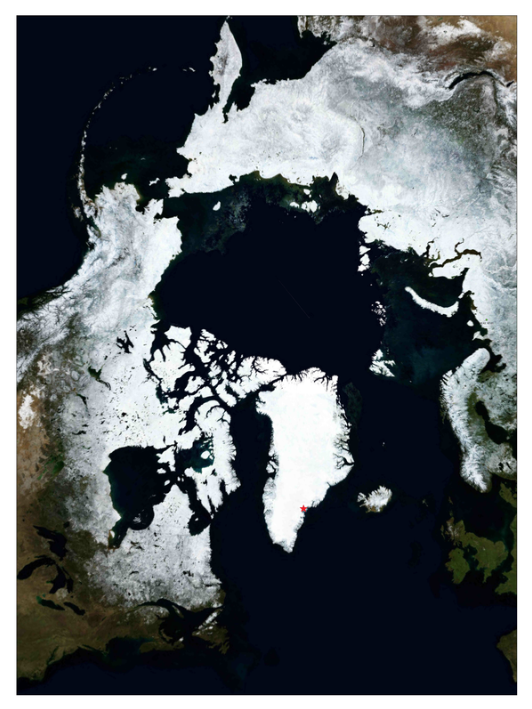 We will all be traveling to Kulusuk, Greenland next week, which was conveniently featured by NASA’s Earth Observatory recently. From Kulusuk we will pack our gear, including ice core drills, temperatures sensors, a down-hole video camera and ground penetrating radars, into a helicopter and onto the ice sheet. We hope you will join us for this expedition. You may want to start watching the weather. Our fist put in date will be April 1, (April Fools’ Day – but this is no joke), weather permitting. Over the next few weeks, will we publish more blog posts about our science, the logistics of getting all our gear to Kulusuk, and life on the ice. I guess there is just one last thing to do, and that is to name our team. The official title of this project is “An initial investigation of the Greenland perennial firn aquifer,” which I admit is not very exciting and I can’t seem to turn into a catchy acronym. So for now we will be the Greenland Aquifer Team. If you reader come up with a better name for our team, please post it in the comments section. We may just adopt it! This entry was posted on Wednesday, March 20th, 2013 at 1:48 pm and is filed under Greenland Aquifer Expedition. You can follow any responses to this entry through the RSS 2.0 feed. Both comments and pings are currently closed. I’ll be following from salt lake city and wishing the GAT team best of luck, good weather and good drilling. Greenland Under-Ice Drilling Expedition (GUIDE). How’s that for a catchy acronym? Best of luck to you all. I’d love to have joined in, living here in Anchorage, AK, I’ve always wanted to visit other Arctic/Sub-Arctic areas like Greenland, Iceland, Northern Scandinavia.